This page will walk through Spring MVC 4 REST and Jackson @JsonView annotation integration example. @JsonView is used to filter JSON response. Spring 4.1 framework and onwards started to support Jackson @JsonView annotation directly. To work with @JsonView, first we need to define view definition. We can have more than one view definition. One view definition can inherit other view definition. Our POJO will be annotated with @JsonView by passing defined view as an attribute. In spring controller we can directly annotate our methods with Jackson @JsonView annotation. The JSON response will be filtered on the basis of configured view while serializing HTTP response body. We can also use spring REST client with @JsonView. Spring provides MappingJacksonValue that wraps the POJO and by setting serialization view, we can filter the JSON being sent to web service server using RestTemplate. Now find the complete example step by step. Find the required software to run the demo. Find the gradle file used in our example. We are using spring boot that will import all the required JAR dependencies of Spring and Jackson API. The object can be contextually filtered while serializing HTTP response using @JsonView. The first step to use @JsonView, we need to create JSON view definitions. We need to create interfaces or static classes. For more than one view we can create more than one interface. It is better to create composite interfaces. Create more than interface within a class for more than one serialized view as HTTP response. To inherit one view by other, we need to inherit one interface by other. Look at the class. We are creating a view filter mechanism for the user profile. We are creating three profile views and those are public view, friends view and family view. Friends view is inheriting public view and family view is inheriting friends view. Jackson provides the annotation com.fasterxml.jackson.annotation.JsonView that needs to be annotated on class properties to include in a specific JSON view serialized in HTTP response body. We have three views here in our example i.e PublicView, FriendsView and FamilyView. The properties annotated with @JsonView will take part in filtering JSON views. 1. In user public profile view, only those class properties will be available which are annotated with @JsonView(Profile.PublicView.class). 2. In user friends profile view, the class properties will be available which are annotated with @JsonView(Profile.PublicView.class) and @JsonView(Profile.FriendsView.class). Spring 4.1 onwards it directly supports Jackson @JsonView annotation. In our controller the methods annotated with @RequestMapping can be directly annotated with @JsonView to filter JSON view in serialized response body. 1. In our example the controller method annotated with @JsonView(Profile.PublicView.class) will produce JSON response only with public view properties. 2. The controller method annotated with @JsonView(Profile.FriendsView.class) will produce JSON response with public and friends view properties. 3. The controller method annotated with @JsonView(Profile.FamilyView.class) will produce JSON response with public, friends and family view properties. 4. The controller method getCompleteProfileById() has not been annotated with any view. It will produce JSON with each and every property as usual. 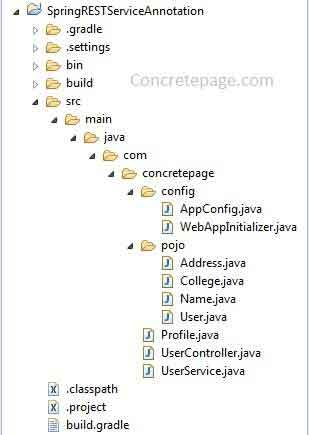 Find the java configuration used in our example. Find the web application initializer. To run the application, find the below steps. 1. Download source code and navigate to root directory of the project. 2. Run command gradle clean build using command prompt. 3. Deploy the WAR file in tomcat. 4. To test the @JsonView(Profile.PublicView.class), run the URL as given below. We will get JSON output as follows. 5. To test the @JsonView(Profile.FriendsView.class), run the URL as given below. 6. To test the @JsonView(Profile.FamilyView.class), run the URL as given below. 7. To test the getCompleteProfileById() method, run the URL as given below. The Jackson @JsonView annotation can also be used with RestTemplate in spring REST client. To achieve it spring provides MappingJacksonValue. It wraps the given POJO to be serialized. For the example we are creating user name example. A user name can have first, middle and last name. We are creating name views such as FirstName and FirstLastName. Find the view defined for user name. Find the POJO being used in our REST client example. Now using MappingJacksonValue we wrap our POJO as follows. To filter the view, set the serialization view as follows. In REST web service UserController class, we have exposed a method as given below. Now find the REST client code with postForObject(). 3. If no view is assigned, the output will be as usual.